As one of the last pupils of the Florentine Mannerist painters, Allori’s works are in many ways homage to artists such as Andrea del Sarto, Bartolomeo, Da Vinci, Pontormo and most of all Il Bronzino, or Agnolo Bronzino. Allori was only five years old when his father died and he was taken under the care of Bronzino, a family friend. His entire young life he spent growing up in Bronzino’s workshop in Florence. Many years later, it was Allori who completed Bronzino’s last fresco in San Lorenzo, which he left incomplete upon his death in 1572. Allori was Bronzino’s favorite student, and in much historical text Bronzino is referred to as his uncle. Allori took very much to Bronzino’s statuesque style of painting, where his subjects had an unnatural, enamel-like surface. His first known work was an altarpiece painted in 1560 for the Chapel SS Annuziata, a piece about the Last Judgment, where Michelangelo’s influence can also be seen in the work. 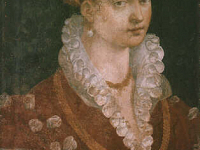 When Michelangelo died four years later, Allori prepared the decorations for the funeral. With such a close relationship to Bronzino, Allori was involved with some of the best Florentine artists of the time. He worked with Giorgio Vasari, (Author of the classic text The Lives of Artist) who was a friend of Bronzino. When the Grand Duke of Tuscany, Medici, commissioned work for the Studiolo of Francesco in the Palazzo Vecchi (Tuscany’s town hall), Allori worked with Vasari. 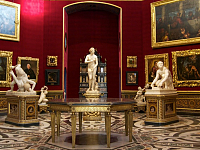 The work was completed around the death of Bronzino, who was court painter for the Duke for many years. Allori completed a piece called the Pearl Fisherman or Pearl fishing, for the Studiolo and was one of 23 artists who created pieces for the building. 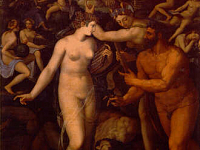 Though, the Duke had utilized Allori’s talents years earlier in 1565 for the decorations of his son, Francesco’s wedding. It was a fitting commission for the adopted son of Bronzino, as Bronzino first worked with the Duke for his own wedding. Allori’s work and life was artistically intertwined with Bronzino’s, but had his own well regarded body of work. This included, The Miracle of St. Peter Walking on Water, Allegory of Human Life, Christ and the Samaritan Woman, Road to Calvary, Dead Christ and Angels, Susana and the Elders, and a piece undeniable influenced by Bronzino, Venus and Cupid. 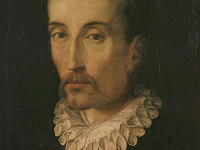 Throughout his life, Allori had many collaborators and students, including Giovanni Mari Butteri, Giovanni Bizzelli, Cristoforo del Altissimo, Cesare Dandini, Aurelio Lomi, John Mosnier, Giovanni Battista Vanni, Monanni and Lodovico Cigoli. 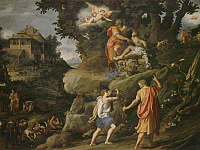 His contributions to Florentine art did not end there though, as he was father to Cristofano Allori, (1577 – 1621). Cristofano took his first painting lessons from his father, but later strayed from his father’s marble-like, cold anatomy of subjects, taking the more natural and colorful influence of the Venetians. Alessandro Allori’s works are seen around the world, in museums in Rome and Florence in Italy, in Montpellier in France and also in Budapest.